Main entrance to the former Dime Savings Bank. One of Mr. Berra malapropisms may have been true in his own financial world, but the former headquarters of the Dime Savings Bank of Brooklyn is worth its weight in gold! It was on a busman’s holiday, a guided walking tour that I took when I discovered an American treasure in a place where treasure was once stored. The pediment above the main entrance to the former Dime Savings Bank. The Guides Association of New York (GANYC) regularly offers tours to its members that are led by its members. Recently Joe Svehlak conducted a tour in his own backyard, Downtown Brooklyn. Mr. Svehlak’s passion for the borough that he has called home for his entire life was front and center. For Mr. Svehlak the changes that are taking place there, the new pushing out the old, are not entirely welcome. More than once he lamented the high-rise, high-end condos, dwarfing all that surround them, and coming at a human, architectural and historical cost that he believes we can ill afford. “Morning and Evening of Life” form Dime Savings Banking, Brooklyn. Pointing out the need for open spaces, affordable housing, livable surroundings, respect for the past and preservation of our architectural patrimony, Mr. Svehlak is a strong advocate for what he admirably believes. He began the tour at the Brooklyn Borough Hall, which was originally the City of Brooklyn’s City Hall; and he led us through busy streets and passed buildings dating from the 1840s to 2015. He saved the best for last though, ending on a high note like no other: the former headquarters of the now-defunct Dime Savings Bank of New York. “Morning” from “Morning and Evening of Life”, the Dime Savings Bank of Brooklyn. Originally known as the Dime Savings Bank of Brooklyn, this financial institution conducted business from 1859 to 2002. The bank chose its name to emphasize to the public that an account could be opened with one thin dime only. Located at No. 9 DeKalb Avenue the former headquarters of the bank was constructed between 1906 and 1908, designed by Mowbray & Uffinger in the Greek Revival style. Twenty-three years later, as its business boomed, the building was enlarged by Halsey, McCormack & Helmer. “Evening” from “Morning and Evening of Life”, the Dime Savings Bank of Brooklyn. The building still serves as a bank; a Chase branch only rents the space, not owning it. The main entrance, facing Albee Square, is flanked by a pair of Ionic columns. In the pediment above the columns sits the Classically styled sculptural grouping, the Morning and Evening of Life. Sculpted by Lee Oskar Lawrie (1877–1963), this grouping is made of marble, the same material that opulently clads the entire exterior of the building. Mercury greets customers and visitors at the front door, the Dime Savings Bank. Mr. Lawrie described the pediment relief as follows, “the two ages of man, a youth rising with the sun, lacing his sandals in preparation for the tasks of the day; and an old man resting peacefully at eventide, secure in the fruits of the days of his activity.” These allegorical male figures rest on either side of a clock, designed to look like a gear rimmed with cogs. It is supported by two smaller gears each edged by interlocking cogs. The polychromed and coffered ceiling, the Dime Savings Bank of Brooklyn. Mr. Lawrie’s best-known work is not architectural in nature; it is the 15-foot tall, freestanding bronze, Atlas, the Titan who supports the heavens. It stands on Fifth Avenue, opposite to St. Patrick’s Cathedral, part of the Rockefeller Center complex. In an architectural sculptural piece not far from Atlas, Mr. Lawrie’s Wisdom hurls his thunderbolts from above the entrance to 30 Rockefeller Plaza. Atlas and Wisdom are in the more angular, geometric Art Deco style. The rotunda, and its 12 red marble columns, the Dime Savings Bank of Brooklyn. If the Dime’s exterior impresses; the interior dazzles, outshining its architectural skin. It takes your breath away! Just as the exterior was built as a temple, so the interior was similarly designed. The rotunda, supported by a dozen, soaring, red-marble columns made from stone imported directly from ancient Greek quarries, is the centerpiece. Client services uses this space today. 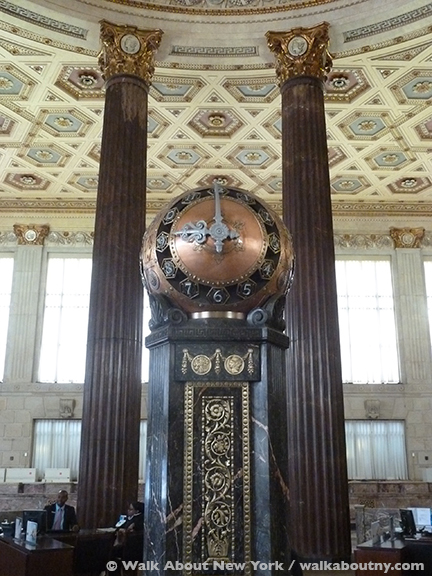 Time is money: a stopped clock at the center of the rotunda, the Dime Savings Bank. A rare example of a grand banking floor in an era of cash machines, online banking and the futuristic BitCoin, this interior reflects a period of spectacular growth for the banking industry in general, and especially for the Dime. This was Brooklyn’s busiest savings bank in the early 20th century. The Dime was once the fourth largest thrift institution in the United States. Medallions styled as Mercury Dimes encircle the banking hall at the ceiling line. The interior is not only one of Brooklyn’s most magnificent spaces, but America’s. Nestled amongst acanthus leaves on the capitals of the Corinthian columns and pilaster, and running around the perimeter of the hall are over-sized versions of the obverse and reverse of the Mercury Dime, the bank’s quintessential symbol. Because the Mercury Dime was not issued until 1916, a full eight years after the completion of the Dime’s first building at this location, all references to Mercury and the dime-styled medallions date from the Depression-era expansion in 1932. “Buddy, can you spare a dime?” was a popular Depression-era song. This grand environment symbolizes a time when savings banks were designed to entice and reassure depositors that however stormy the economic climate, their money was safe. The Dime’s headquarters filled this role beautifully. Real estate values have soared and banking practices have changed dramatically rendering such grand spaces for banking unnecessary. Although structures belonging to many other institutions have been destroyed or converted to other uses, the Dime as a whole has remained remarkably intact since the 1930s. New York City’s Landmarks Preservation Commission has implemented special rules, identifying important architectural features that are to be preserved, while allowing for the addition of such modern-day necessities as security cameras and ATMs. A grille above the side entrance shows men hard at work at various labors. The Winged Liberty Head Dime is commonly called a Mercury Dime. It is assumed by most people that the coin’s obverse side shows Mercury, the Roman god of commerce and messenger to the gods. In fact, it is Lady Liberty, wearing a winged Phrygian cap; the wings represent freedom of thought. On the reverse side is the Ancient Roman symbol of power and authority, a bundle of birch rods bound together with an ax, the fasces. Since 1919 it has been associated with Benito Mussolini’s nationalist party, the Fascists. Detail of the grille at the side entrance, the Dime Savings Bank of Brooklyn. The Mercury Dime was minted between 1916 and 1945; these coins are 90% silver, therefore the melt value for a Mercury dime is $1.20, based on $16.64 for an ounce of silver, the price at the time of publication. To a collector the coins would be worth more. Because they were minted in limited quantity, the 1916 Ds are valued between $300 and $400 each. That is so much more than a thin dime! Remember though, when this grand building was created, a thin dime could buy a pound of butter. The DeKalb Avenue entrance features transom grilles showing allegorical figures hard at work in labors of industry and trade. The great irony of this decorative motif is that there was very little work when the designs were created. It was the start of the Great Depression, 25% of the workforce was unemployed. Even the radiator grille is a work of art: when banks were banks! Get yourself out to Downtown Brooklyn to see one of the grandest interior commercial spaces in America. Because the Dime’s DeKalb Street entrance, the banking hall and its mezzanine interior were designated a New York City Landmark in 1994, the building cannot be altered. Who knows for how much longer we will have the opportunity to freely enjoy it. An announcement was recently made that the bank may be sold for retail use. See it while you can! How magnificent. Thanks for the introduction.